When it comes to checking off everything on the list of foods to eat before you die, Mountain Cookery poses a harder problem than most. 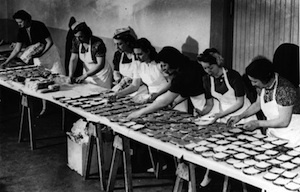 In this third installment (check out parts one and two), exploring Appalachian cuisine, Eat Me Daily’s Kathleen Willcox looks at the intersecting paths of food festivals and hillbilly suppression. To truly get jiggy with the more esoteric aspects of Appalachian cuisine, you can't do much better than the region's myriad food festivals. Conventional wisdom is that the ones that focus on just one theme are the best, whether it's a celebration of roadkill, moonshine, or grits. If thematic festivals aren't your speed, there's a wealth of general ones too — though most seem to suffer from a "jack of all trades, master of none" syndrome. The broader they are, the more humdrum the overall results. “It is a poor, weak-spirited county in eastern Kentucky now that has not its feud and its band of thugs protected by the courts. … The savages who inhabit this region are not manly enough to fight fairly, face to face. … One can hardly believe that any part of the United States is cursed with people so lawless and degraded.” – The New York Times, July 26, 1885. It's been over a century since that article was written, but not much has changed, at least in terms of popular perception. Not too long ago, 20/20 released a macabre and lurid expose of the region titled “A Hidden America: Children of the Mountains,” and Newsweek recently published a piece called “Hillbilly No More,” that documents West Virginia governor Joe Manchin’s perhaps slightly overenthusiastic attempt to shed any last remnant of the region’s roots. But while he thinks of the West Virginia heritage as hopelessly hick and hackneyed, there are plenty of enthusiasts who find it refreshingly rustic. Needless to say, considering his role in the cook-off, Cain doesn’t share Manchin’s disdain for the competition. Instead, he argues that his conference of like-minded folks joined together for the consumption of groundhog, possum, deer, venison, turtle, chicken, turkey, and the occasional alligator helps people get back in touch with their culinary roots — not a bad thing in his book. Oh, and just for the record: the ingredients for the event don’t actually have to be removed from the wheel of a car. It's the thought that counts. Cain was born and bred in West Virginia, joined the Air Force, and traveled the world for 28 years, only to come back to Pocahontas County to give back to the community he was raised in and still loves more than any other place he’s been. He hopes the Cook-Off, slated for September 26 this year, will help older locals reach back to the habits of their youth, and help today’s youth explore well-trodden paths they probably never knew existed. Of course, good old-fashioned fun glints like the golden scales of a brook trout beneath the running river of Cain’s altruism. “We close the whole town for the day,” Cain beams. “I love looking up and down Main Street and seeing a sea of people having a good time. While the competition tries to keep things as local and amateur as possible, with some restaurateurs inevitably entering the fray, it’s drawing upwards of 15,000 spectators and eager eaters from all over the country. And Cain adds, “I’m hoping I can get the governor to be a judge this year." 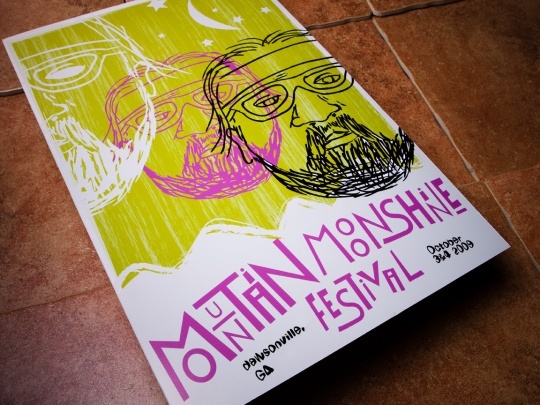 Another Appalachian festival that promises all the delicious, innocuous peril of a Dukes of Hazzard car chase is, natch, the Mountain Moonshine Festival, held in Dawsonville, Georgia each October. This not-to-be-missed fest explores Dawson County’s moonshine-running history; upwards of 100,000 people flock to the birthplace of NASCAR to check out old moonshine stills, listen to tall tales about late-night chases, celebrate the likes of Gober Sosebee and Raymond Parks and gawk at the southeast's largest collection of moonshine-hauling cars. Oh, and the booze may be a draw too. “We haven’t found a way to sell moonshine legally,” said the festival’s organizer, Calvin Byrd. “But if you run into the right person, you could probably find some. But if you do, I don’t want to know about it!" And let’s not forget the home-cooking: the festival boasts 30 to 50 food vendors, so soup n’ beans, ramps, chicken n’ dumplings and fried cornbread will be on hand to pair with a hefty tumbler of either the red-meat and grease-friendly Midnight Moon, or Thunder Valley, the slightly more delicate quality of which shines next to lighter fare. And best of all, any guilt over getting juiced up on corn juice can be assuaged by the fact that all of the proceeds go to Kare for Kids, a non-profit Byrd runs to help local children get school supplies, Christmas presents, medicine and clothes year-round. 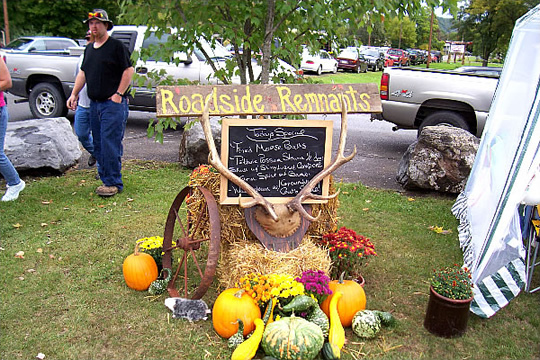 Roadkill and moonshine are just a drop in the bucket of Appalachian food festivals. 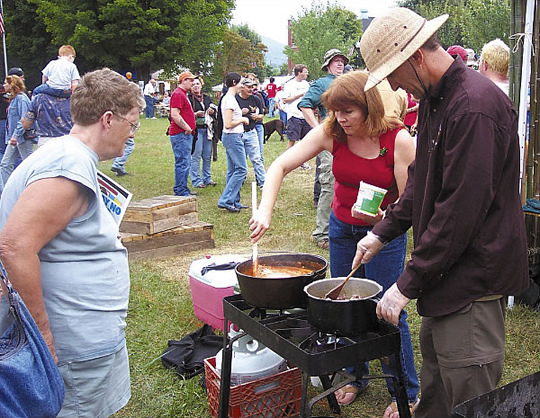 Others include the World Grits Festival in St. George, South Carolina (the grits capitol of the world); the Feast of the Ramson (a celebration of ramps, the pungent wild garlic that are the first vegetable harvested each spring) in Richwood, West Virginia; the Appalachian Mountain Food Festival in Cincinnati, Ohio; and the Black Walnut Festival, (forget the nuts, go for the will broom-making seminar and the Lumberjack Contest) in Woodsfield, Ohio. If you can't make it out to the Roadkill Cook-Off, we'll bring the roadkill to you. This recipe is courtesy of Rachel Dickenson of Dunmore, W.V., and the Pocahontas County Chamber of Commerce. 1. Slice pork and marinate in apple cider overnight. Skin groundhog and soak in water and vinegar overnight. 2. Preheat an oven to 350. Remove pork from cider and dip in separate bowls of egg and buttermilk; then seasoned flour (with Cajun spice, garlic, salt and pepper). 3. Fry the pork in vegetable oil until golden brown and then finish cooking in 350 oven for one hour or until desired degree of doneness is achieved. Set aside and cover with foil until groundhog gravy is done. 4. While the pork is baking, debone the groundhog, and rinse. 5. Add the hog plus 1 inch of water to a pressure cooker, cook at 10 lbs of pressure for 45 minutes. 6. Remove hog and let cool. 7. Over medium heat, cook groundhog meat, water, beef broth, and mushrooms, stirring and scraping up fond until a nice gravy develops. If needed, thicken at the last minute with flour. 8. Strain out groundhog meat and season to taste with salt and pepper. Pour over pork and serve with a biscuit.